The Lucidchart team took a trip out to the west coast for Google Cloud Next ’18. 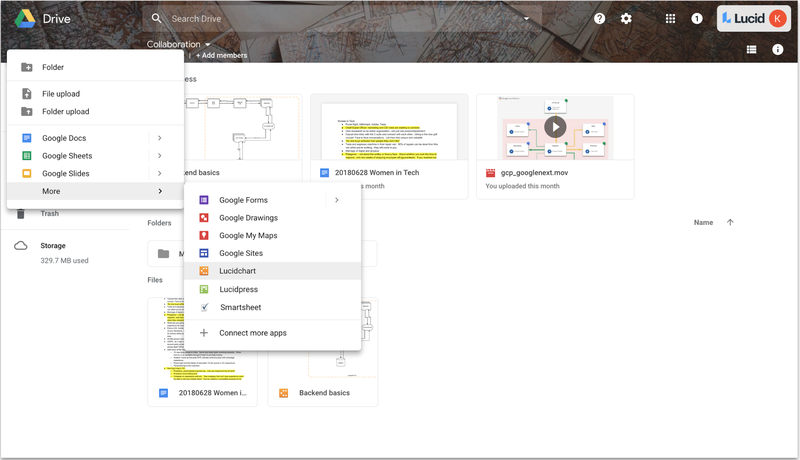 We’re excited for this opportunity to show attendees the power of working visually in Lucidchart, especially since our platform integrates with multiple Google applications (you can read more about that in a previous blog post). This afternoon, Katie Menzies, one of our product managers at Lucidchart, showed attendees several use cases to explain how Lucidchart can help organizations communicate complex ideas and processes. For those who couldn’t make it out to San Francisco or didn’t attend the session, keep reading for a recap of her presentation. Most of us have probably felt this way. You meet with your co-workers, and you think you’re all on the same page—only to realize that each person had a completely different understanding of your business problem, your plans to complete a project, etc. 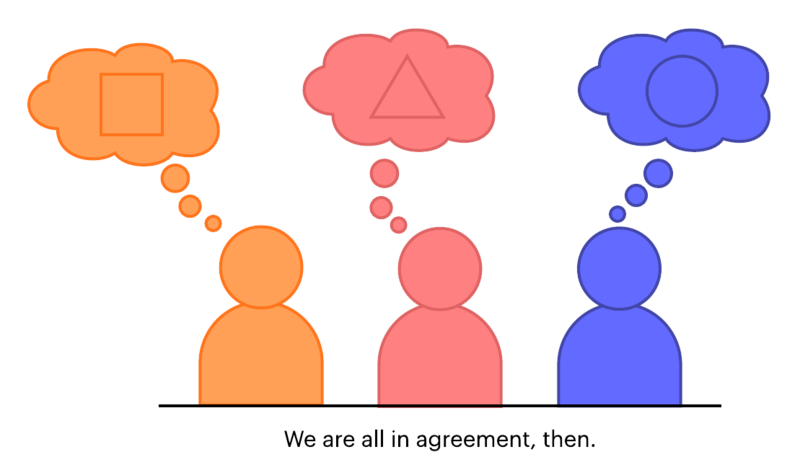 But when you use visuals, you can clarify ideas, information, and processes so everyone walks away with the same understanding. By encouraging users to work visually, Lucidchart can help your organization avoid moments of miscommunication, so you don’t waste time or opportunity working in different directions. Plus, once you have those visuals, you can easily help new team members catch your vision. P.S. Katie even used Lucidchart to create all of these images! To illustrate this concept, let’s imagine a day in the life of a software company. This company is growing fast and hiring quickly, and leadership wants to make sure that new developers, product managers, and UX designers are brought up to speed quickly. Kat, a product manager, is one of these new hires. On her first day, she walks into the office to find her computer set up just the way she requested: a Macbook Pro with an additional monitor, a keyboard, and a mouse. To achieve this, Kat's company has standardized the hardware provisioning process. 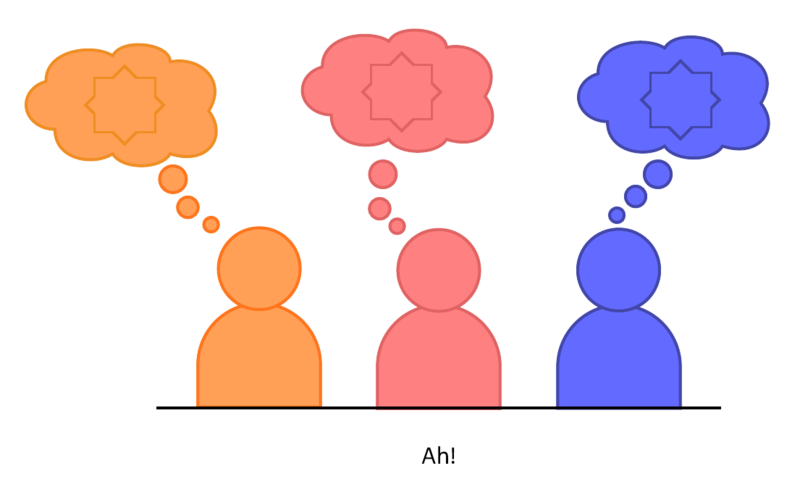 Kat attends a meeting to learn about scrum team structure, sprint cycles, and system functionality, often depicted with diagrams. One presenter, James, needs to show how the system’s backend works, but he hasn’t had the time to put his slides together. He decides to build a diagram in real time showing the high-level relationships in the company’s software architecture. By the end of the meeting, James has a diagram that he can use for next week’s intake of summer interns, and he promises the new hires that he will upload his diagram to Confluence via the Lucidchart integration in case they have other questions. As she returns to her desk, Kat notices that her manager, Lily, has pulled up Kat’s information. Lily explains, “I’m updating an org chart so I can present you and your role at our next department meeting. I got a CSV from HR, so I’m just adding your information into the file and then I’ll generate a new org chart that includes your information.” Lily refreshes the org chart in her team’s slide deck, and she’s set for the meeting. Lily then gives Kat an overview of the team and the tools they use. Through SSO, she adds Kat to the Team Drive and points out some cloud software available to her, including Lucidchart. Now Kat’s ready to dig into her work. She wants to find out what customers think about a new feature, and to do this, Kat needs to pull some usage data. Her plan is to build an SQL query in the company’s newly migrated database, but as she pours over the DBMS and tries to familiarize herself with the way it’s set up, Kat realizes that she doesn’t want to take too much time building her query or—worse—break something. Kat looks on Confluence and finds several ERDs that visualize database structure—just not the new database she’s looking for. She pings the head of analytics, Tim, on Google Hangouts Chat. Tim tells Kat that he hasn’t documented the new database yet, but he can create one right now. 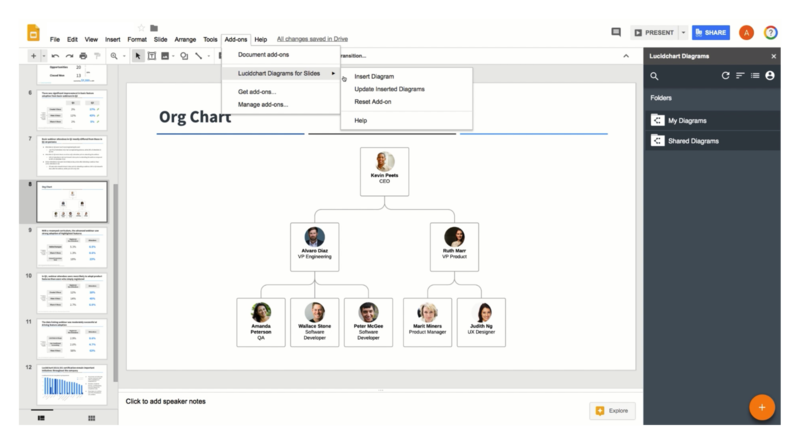 Using a Lucidchart integration, he starts a new diagram right in Hangouts Chat that Kat can access. Then he uses the ERD import in Lucidchart to generate an ERD of the new database. Because Lucidchart also integrates with Confluence, Tim can easily add this ERD to a new Confluence page so other employees can find it without his help. A month later, Kat sees her friend Mike quickly eating lunch in the kitchen. As they catch up, Mike explains that he’s in a rush because his boss asked him to put together a presentation on migrating AWS to GCP—and the presentation is tomorrow. Mike wants to show the system before and after the migration. He says, “Usually a diagram this complex would take me forever, but I found a shortcut.” He uses the AWS import in Lucidchart to generate a network diagram for his first layer. When Kat attends the presentation the next day, she sees that Mike added a second layer that shows what the system will look like once it’s migrated to GCP. As you can see, Lucidchart can apply across multiple teams in any industry. Whatever your use case, you can take advantage of its intuitive interface, collaborative nature, extensive shape libraries, and automation features. 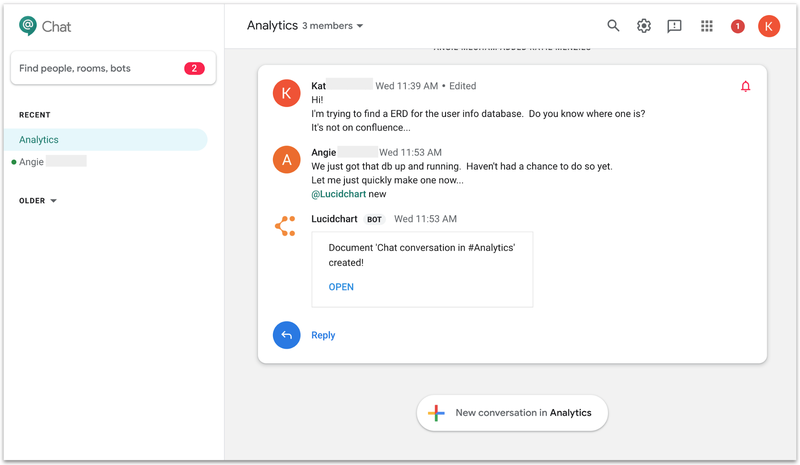 It also integrates with many of the platforms that your company uses every day—including G Suite. See how Lucidchart can increase transparency and speed up onboarding where you work.